On a sunny summer day, you decide to enjoy the weather and the scenery and take a short Baca County road trip. Unfortunately, while you are out, you come upon a two vehicle collision involving multiple people. It appears that you are the first to arrive on the scene. What do you do? Grabbing your smart phone, you dial 9-1-1 and the calm voice of the dispatcher reaches your ear. You describe the situation and location and she keeps you on the phone while paging out the appropriate agencies to respond – EMS, Fire, and Law Enforcement. With the approach of National EMS Week, May 17-23, 2015, I’d like to take a few moments of your time to introduce or re-introduce you to the history of EMS with a special emphasis on our local system. It’s a system we often take for granted. Many adults born and raised in the United States now almost do not remember a time before 9-1-1 or at least some method of calling for professional services during an emergency. 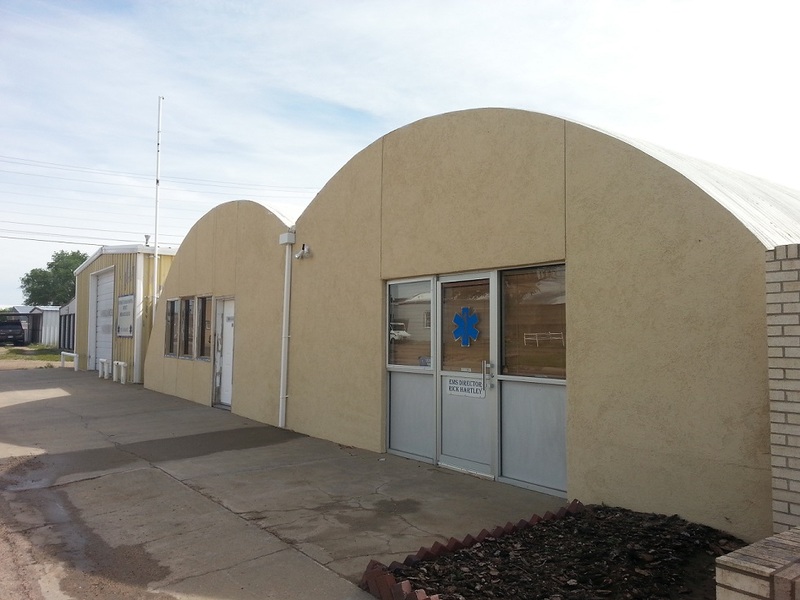 The history of 9-1-1 in Baca County is less than 25 years old, and the history of organized emergency medical services (EMS) in Baca County and the United States as a whole is only slightly older—developing in the late 1960s and 1970s. However, the past 50 years is marked by constant and rapid change. Once upon a time, before ambulances, before Emergency Medical Technicians (EMTs) or Paramedics… but not quite before doctors and hospitals, pre-hospital transport was available, if somewhat rudimentary. We have watched, for example, the old western movies as they throw the gunshot cowboy face down over the back of the horse and race into town after the doctor. Talk about a bumpy ride! 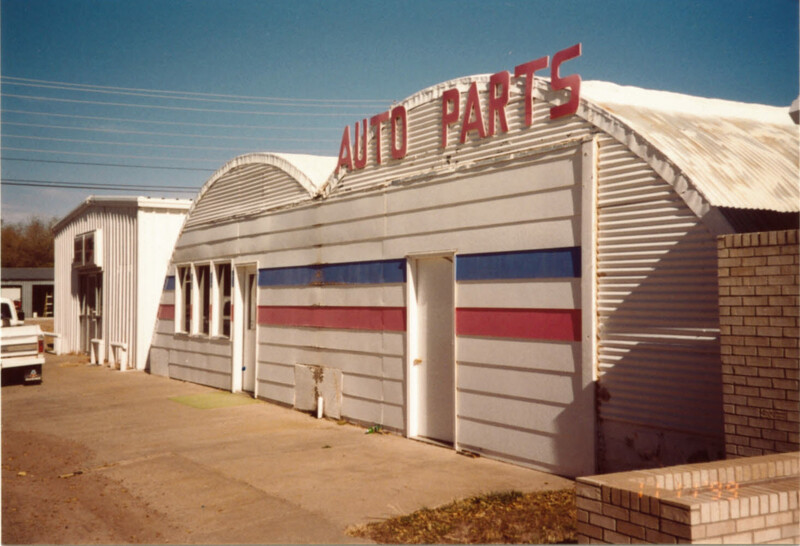 In a similar manner, after the development of the motorized car, the injured or ill were loaded in the back of the pickup or car and transported. Sometimes, this responsibility fell to the mortician or coroner (often one in the same) since he owned the best transport vehicle for horizontal persons— the hearse. According to their website, Dykes Memorial Services out of Walsh states the first service of that kind provided in that area was by Dykes and Morich Furniture and Undertaking when Mr. Dykes transported many patients back in the 1930s to the hospital in Halstead, Kansas when they became ill from “dust pneumonia.” In Springfield, Rich Funeral Home, now Maltbie Funeral Services, began around the same time. Some of you still remember how Mr. Bob Rich responded to vehicle accidents with his hearse and transported patients either to the hospital in Walsh or to the funeral home in Springfield. Paramedic Rick Hartley, long-time Baca County resident and current EMS director at Southeast Colorado Hospital Ambulance, recalls when he was just a young boy, his mother rode as an untrained attendant in the back of Mr. Rich’s hearse along with two critically-injured patients from a vehicle accident while Mr. Rich drove them all the way to a hospital in Denver. This scenario was not unique to Baca County. Across the nation, it became more and more evident that a system was needed to better deal with the injured and ill. In 1966, the National Academy of Sciences and the National Research Council published an article titled “Accidental Death and Disability: The Neglected Disease of Modern Society” which soon came to be known as the “White Paper.” The paper pointed out the striking number of individuals who had died or experienced permanent disability from trauma, just the previous year, from preventable causes. In addition, it noted a lack of training for those caring for patients in the prehospital setting. On the heels of this paper came an increased recognition for training and a purposeful organization of training programs for what would come to be known as “paramedics”. As a result, the National Highway Safety Bureau, today’s National Highway Traffic Safety Administration (NHTSA) was developed as the founding federal organization for EMS. The now internationally recognized “Star of Life”, representing EMS, was developed by the NHTSA in 1977. One of the industry’s first training programs was in the Los Angeles, California area. Shortly after this program was implemented, the nation was introduced to organized emergency medicine via paramedics through a television show called Emergency! when it debuted in 1972. In this show, you may fondly recall John Gage and Roy DeSoto, two fictional L.A. County Firefighters trained as paramedics, responding from “Station 51” to all kinds of calls and putting their newly-acquired skills to good use. Few who have been around EMS any length of time doubt that this show did much to educate the public on the growing need for, and proper use of, pre-hospital care and training. Though many of the practices and supplies used in those early days of EMS have changed, old and young alike are now enjoying Emergency! again as several seasons have been released on DVD as well as the internet through streaming video sites like Hulu and Netflix. While Johnny and Roy were impressing and educating the general public on the future of emergency medicine, Baca County had already begun developing our emergency services system. 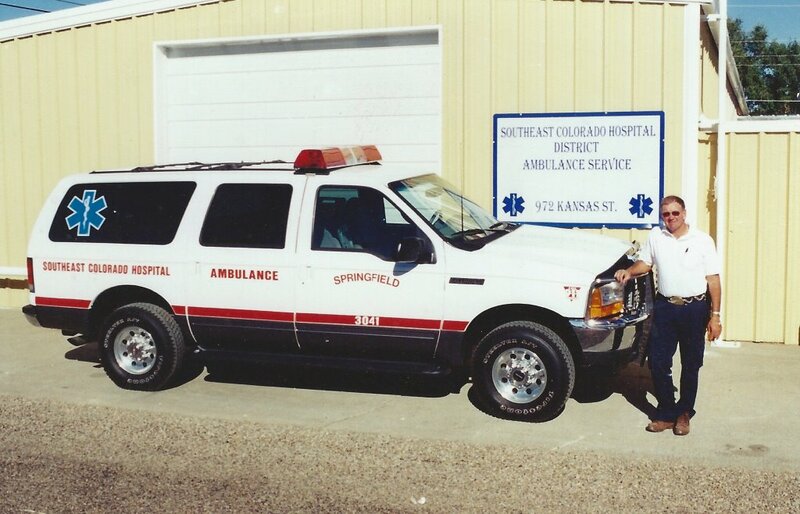 Two ambulance services evolved: Southeast Colorado Hospital Ambulance out of Springfield and Walsh Ambulance Service based in Walsh. In addition, Quick Response Teams (QRT) were started in Campo, Two Buttes, and for a time, Pritchett, in conjunction with Kim out of Las Animas County. 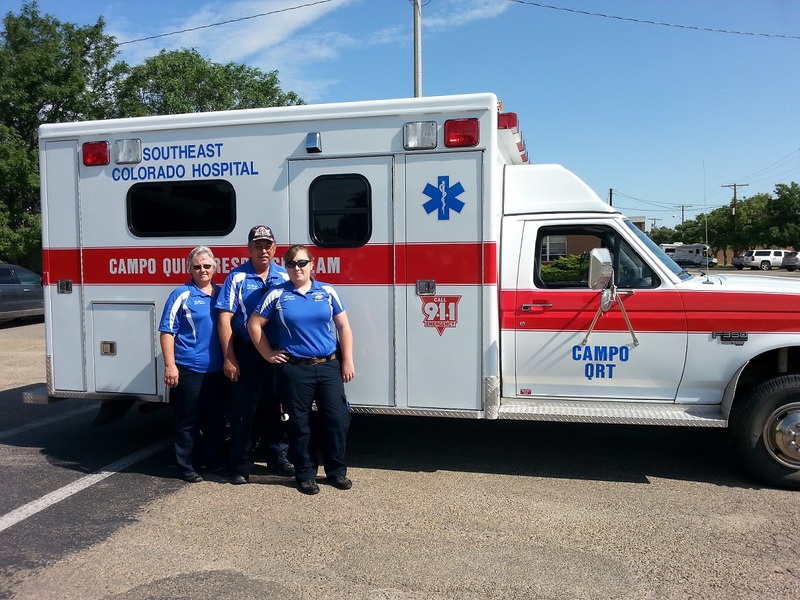 Though Two Buttes and Pritchett no longer have a QRT, Campo’s QRT is still active and now functions as a subsidiary service of Southeast Colorado Hospital Ambulance. 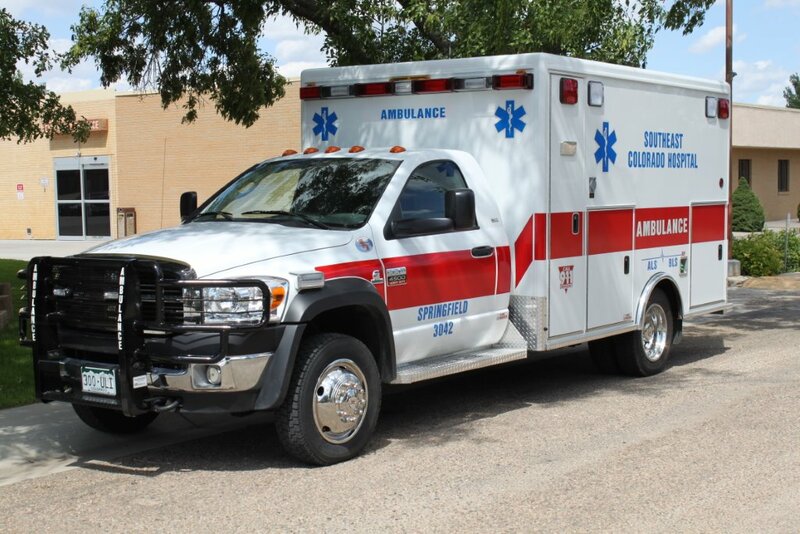 Walsh and Springfield both still operate ambulance services with 24/7 coverage in each of their districts and Kim also operates an ambulance service based in Las Animas County. 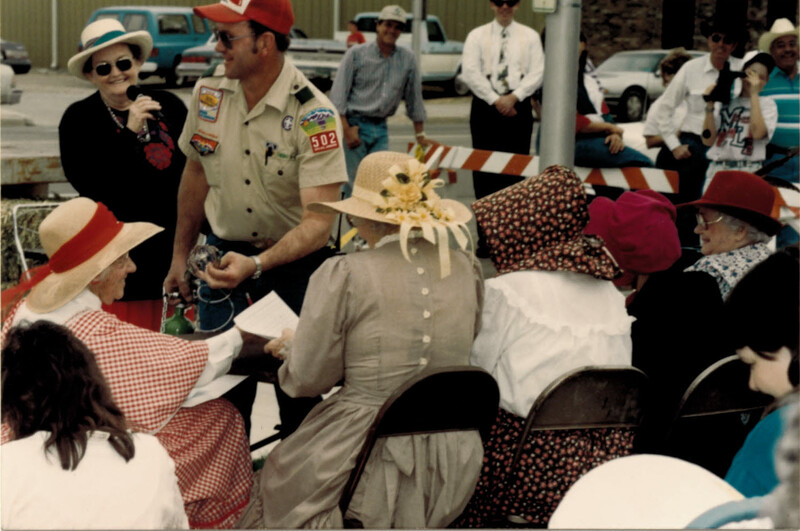 Numerous Baca County residents trained as EMTs and began volunteering to help their communities. A man who has “worn many hats” in our county as the local dentist, county coroner, former Walsh EMS Director and Fire Chief, and currently still practicing as a firefighter and EMT, Dr. Bob Morrow commented on how he got involved in EMS. Morrow notes “like most people”, he got into it because he wanted to help and was “willing to do things for the community”. After first volunteering as a firefighter, he recognized the need to become an EMT and once he “got a taste of it, just stuck with it.” His wife, Dolly, who also spent time volunteering as an EMT remarked, “It just seemed like the natural thing to do. In a small community, you look out for each other.” These and many, many others have spent countless hours caring for residents and visitors to this county day and night over the past several years. Communication is the next obstacle to be tackled now that ambulances and EMTs are in place. LeRoy England, former law enforcement officer for Campo and current Emergency Medical Technician with Campo QRT notes how communications have changed over the years. “At first, our response was by phone or through the law enforcement radio. 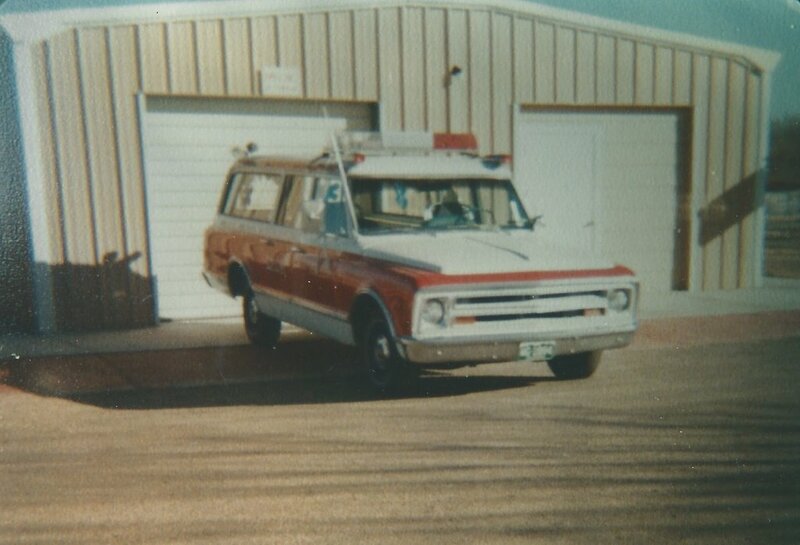 Then we purchased pagers that operated on the state EMS radio system.” Later, they had portable handheld analog radios. Now, Baca County has switched to the nationwide 800 digital system. With the advance of cellular phone technology, EMS communication is sometimes no longer broadcast even across the digital radio system. However, the 9-1-1 system is still a very important link in the EMS chain. According to the Baca County Sheriff’s Office, in June of 1991, a letter of agreement initiating the process to bring the 9-1-1 system to our area was signed by then-commissioner, Roy Brinkley. The following year, dispatcher Devonn Rider spent several months driving all over the county to correct addresses for the new 9-1-1 system database. On January 1, 1993, at 00:33 (that is the middle of the night for those of you who may be unfamiliar with military time), the first 9-1-1 call came in. It was a single vehicle rollover south of Springfield. Springfield Fire Department, Springfield EMS, Baca County Sheriff’s Office and Colorado State Patrol were all dispatched to respond. 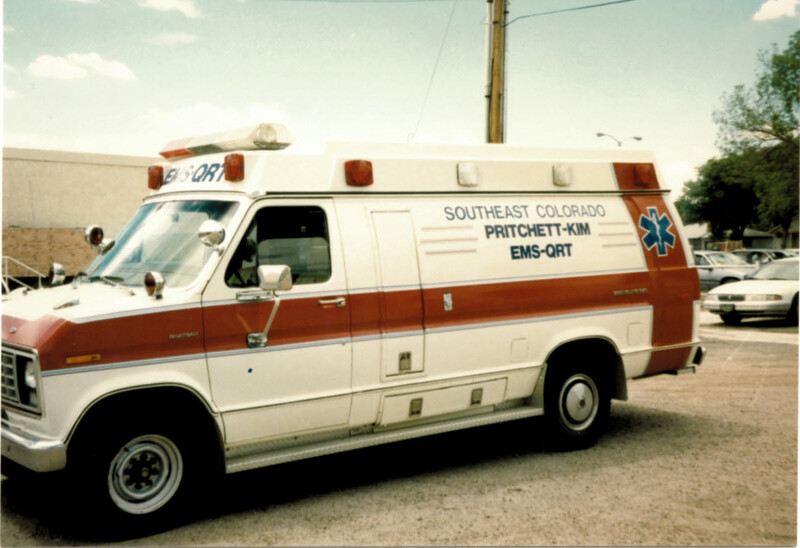 And as they say, “the rest is history.” The truth is, there is a lot more to this history, so tune in next time for part two as I take you on a reminiscing journey through the story of Southeast Colorado Hospital Ambulance. In the meantime, to each of you who have sacrificed your time and energy, who have gone without sleep, missed family events, worked in bitter cold and suffocating heat, faced death and disaster in order to bring aid to those in need right here in Baca County, thank you. You deserve our most heartfelt respect and appreciation.